It was 7:00 in the morning as I sprung up from my bed, silencing the 5th among a dozen alarms I had set for that morning. After a night of disturbed sleep and mulling over the day that was to come, I decided to finally get off the bed and suit up. The day of the interview had finally come. Burning hours of midnight oil in remembering the names of presidents, cabinet portfolios and CEOs would soon be put to test. As I reached the venue and my name was called out, my heart was racing, anxious to ace the interview and secure a seat at one of the top B-Schools of the country. One of the interviewers, after glancing at my profile asked, “ Which major are you planning on pursuing in your PGDM ?”. I fumbled but eventually picked up, trying to sound confident. Like most other aspirants, choosing a major was a decision I had postponed for later. The major would be the option which had the best placements in that college! This seemed like a logical approach since I had to get into one of the top ten, no matter what they excelled in. I attended all the interviews, carrying forth this attitude. Needless to say, I failed at all of them and converted none. The effort I had done for CAT 2017, securing a good percentage, simply washed away. I spent the next 6 months, finding my real calling. My search first began by looking at jobs, that I dreamt of doing after my MBA. I spoke to friends, family and colleagues, trying to figure out what actually happens in each job role. Post this, I vested time in gauging my strengths, weakness and areas of development. While doing this research, I stumbled upon an interesting fact. There were many things which I was unsure of having competency in, but I definitely knew a few things that I couldn’t do. Through a series of keen observations, deductions and interviews, I finally had the answer. Shortlisting the best colleges that fit my major and applying to specific programs, I prepared a comprehensive list of applications to fill and exams I had to give. It was now time to get back to the rigor. Solving questions of Quantitative, Logical Reasoning, Verbal Ability and Data Interpretation over the next 4 months, I was once again ready to welcome the oncoming barrage of exams. However, this time, it felt different. Personally, there seemed to be a larger meaning to all of it. I felt more confident and the exams seemed to have more relevance to my goal. Suited up once again, I was sitting on the chair, facing 3 interviewers. Like a Déjà vu moment from last year, one of them asked, “ What major do you plan on pursuing in the 2nd year?”. Confidently, I answered, “Marketing”. 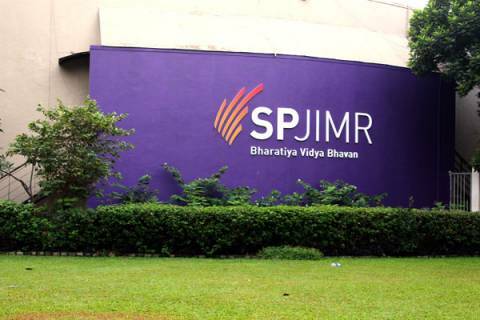 Six months into my PGDM at SPJIMR, I am happy that I know what I want to do with my life. Every time I am faced with a hurdle, or a bout of dissatisfaction, I know the exact path that I need to follow. Somewhere deep down, I believe the college saw my conviction to pursue Marketing, and that has enabled me to get to an institution of such repute. Looking back, I realize the unforgivable fallacy that my then naïve mind had; applying to all colleges in the top 30, and choosing my major based on what their strength was. It is one of the least effective ways to approach the admissions to a college and simply leaves you disheartened, since no amount of training and preparation by a coaching institute, can fake clarity of thought. The strong advice I would give to all aspirants is, to decide what they want to do, and then choose the college, and not the other way around. No matter how much time it takes, it is imperative to find your true calling. Not only does it give you clarity, but superficially speaking also shows conviction in interviews. Moreover, your true test begins only once you are inside the institution. It is only a sense of direction that would give you the driving force to survive. I believe that this strategy truly works and this was what probably helped me secure 10 converts among the Top B-Schools of this country.